On January 18, 2011, seven religious leaders from Texas will hold a groundbreaking panel discussion in Houston addressing faith-based views on the death penalty. The panel will be moderated by Sister Helen Prejean (pictured), author of Dead Man Walking, and Vicki Schieber of Murder Victims’ Families for Human Rights. The free presentation will include leaders from a diversity of faiths and denominations, including: Cardinal Daniel Dinardo of the Roman Catholic Church; Rev. Daniel Malendez, President of Pastors in Action; Bishop Mike Rinehart of the Evangelical Lutheran Church; Rabbi David Lyon of the Congregation Beth Israel; Rev. Mike Cole of the Presbytery of New Covenant; Rev. Harvey Clemons, Jr. of Pleasant Hill Baptist Church, and Bishop Janice Huie of the United Methodist Church. Click here to see a brochure on the event (RSVP). In a recent op-ed in the Richmond Times-Dispatch, two leading conservatives declared that the death penalty in the United States "is no longer a necessary form of punishment." 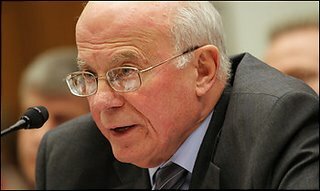 Richard A. Viguerie (pictured) and Brent Bozell urged their fellow conservatives to consider that the death penalty "is an expensive government program with the power to kill people." "Conservatives," they wrote, "don't trust the government is always capable, competent, or fair with far lighter tasks." They particularly noted that they had called for clemency for Teresa Lewis, a woman with low IQ who was recently executed in Virginia. Viguerie and Bozell based their conclusions on both religious grounds and the writings of John Locke. Regarding the need to protect society, they wrote, “We now… have maximum security prisons that were incapable of being built in Locke's time. Society may protect itself without putting a human to death as it would a wild animal. Since we believe each person has a soul, and is capable of achieving salvation, life in prison is now an alternative to the death penalty.” They concluded with the caution that, “When it comes to life and death, mistakes are made.” Read full op-ed below. The organization Catholics Against Capital Punishment recently noted activities related to the Catholic Church's official position on the death penalty. For the first time in recent years, the United States Conference of Catholic Bishops’s annual Respect Life program is urging its participants to make opposition to the death penalty a significant part of carrying out the Church’s pro-life teachings. The statement is based on the 1980 Statement on Capital Punishment of the U.S. Bishops in which they voiced their opposition to the death penalty and affirmed the Catholic Church’s belief in the sanctity of all human life. The Death Penalty Information Center has recently updated its information packet entitled "Death Penalty Resources for Communities of Faith." This packet was initially developed to help a wide spectrum of religious groups address the death penalty by providing information, discussion questions, and multi-media resources. These materials offer a framework useful for any discussion of capital punishment and do not directly involve religious or moral instructions. Each packet contains a CD with statements on the death penalty from various religious denominations, death penalty fact sheets in English and Spanish, and answers to questions about the death penalty. It also includes video clips, bulletin inserts, and discussion guides on four key death penalty issues: Innocence, Race, Victims and Costs.